is for the cooking novice like myself. An incredibly easy recipe found while flipping through the most recent issue of Whole Living. My child is a very picky eater so I have to use some trickery when offering up healthy snacks – however she does surprisingly loves these. 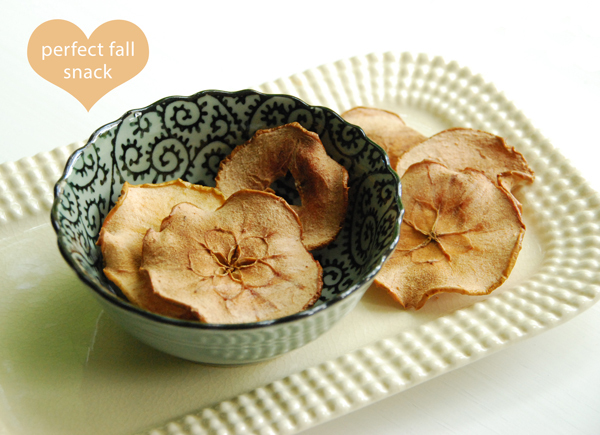 But it’s the perfect time of year to make Apple Chips, since fall is apple picking season (find a great resource here). It’s better to use sweeter apples (I prefer honey crisps), but all you need to do is slice the apples of your choice crosswise 1/8 inch thick and remove the seeds. From there you simply heat the oven to 225 degrees, and bake them on a baking sheet lined with parchment paper for 1 1/2 hours. Flip the chips then continue baking for about another hour until crisp. Such a tasty and simple snack! get my hands on The Meat Free Monday Cookbook. Of course, it did capture my attention because it has Stella McCartney’s name attached to it, but I have been planning to cut back on meat for some time now. The book gives guidance on how to eat meat-free one day a week and offers easy and tasty recipes. The best part about it is that you don’t have to be a vegetarian to try this one out. marinade with a mix of spicy and sweet flavors. This Jamaican Style Jerk Sauce is definitely my go-to for summer grilling. A random find at the grocery store, that now leaves me wanting to try the rest of the marinades and sauces they offer. pepper poppers are a refreshing mix of three cheeses, along with a good kick of spice from the jalapeño. We had them as an appetizer while we grilled dinner on our roof deck – and then I barely ate my meal because I filled up on these guys. Anyway, find the recipe for these tasty starters here. growing a garden may be in my future, I read an interesting article by Ellen Ecker Ogden about fresh herbs. The writer and designer suggests some basic pairings of food and herbs that to some might be obvious, but to me was enlightening. The dishes I prepare tend to lack a bit of flavor, so having this little cheat sheet around may prove to be quite helpful. really simplifies my life in the kitchen. So when my friend Laura graciously passed on the recipe for Crock Pot Cashew Chicken, it made me very happy. It was so easy and ended up being really tasty. If you have very little time to prepare and cook a meal, this one is perfect. Below are the ingredients the recipe calls for, however I noted some things I would change next time around. In a 4 quart slow cooker combine mushroom soup, soy sauce and ginger. Stir in chicken, stir-fry vegetables and mushrooms (again I would use all fresh veggies). Cover and cook on low heat setting for 6 to 8 hours or on high-heat setting for 3 to 4 hours. At last-minute stir cashews into chicken mixture (I added them too soon and they got too soft). Serve over rice and enjoy! The 10 best tacos in America? have tacos just about every other week, they’re easy to make and I don’t really have to put much effort in to know they are going to turn out good. The Taco Truck is also our go to when ordering out…wow we eat a lot of tacos! So when my brother sent me this article on the 10 best tacos in America, I was fully intrigued. A tasty taco means something different to everyone, but my must have fixin’s are refried beans, olives and jalapenos. Pair that with a margarita and I’m all set. it’s not that I’m discovering anything new here, but Bob’s Red Mill Vegi Soup Mix is hands down my new fav. It’s all natural, healthy and is chock full of green and yellow split peas, barley, lentils and little bits of pasta. It does take about an hour to cook, but all you have to do is mix with water (also add any spices you may prefer) and voila you’ve got a really hearty meal. For those soup lovers out there, it’s a must try. this Soba Noodles with Kale and Walnuts recipe the other night and it was a hit. I really only post easy dishes because quite simply, it’s all I can handle, and this one was a snap to whip up. This dish was featured in Oprah magazine and comes from the ladies of In the Small Kitchen. I improvised a little by using chinese style noodles (I wasn’t able to find true soba noodles) and added a bit more kale and walnuts than called for. The left overs from this side dish turned into a delicious lunch for the next day. A must try.